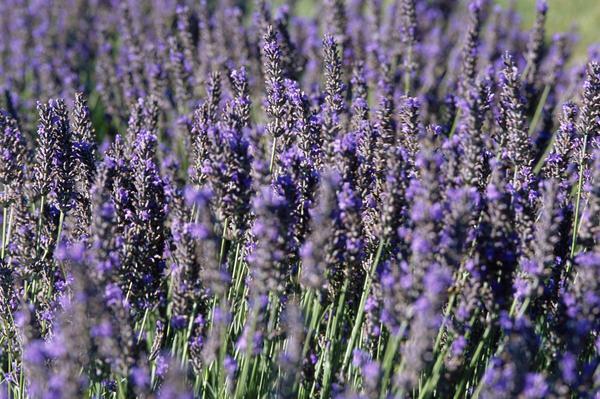 What do you think of when you hear the word lavender? This is what comes to mind for me…my inspiration for today’s outfit. You like my house shoes? It’s April and I’ve got fur shoes on. I’ve always been plagued by cold feet…no matter what time of the year. Besides, hubby keeps the house so cold! 10. 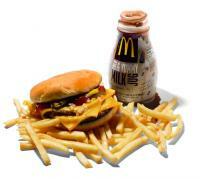 Worst Burger Kids’ Meal – McDonald’s McDouble Mighty Kids Meal with Fat-Free Chocolate Milk Jug: 765 calories, 30 g fat, 1215 mg sodium. 9. 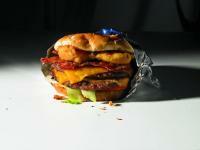 Worst Basic Burger – Five Guys Bacon Cheeseburger: 920 calories, 62 g fat, 1310 mg sodium. 8. 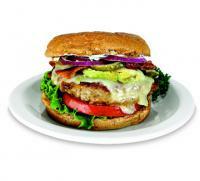 Worst Healthy Burger – Ruby Tuesday Avocado Turkey Burger: 968 calories, 61 g fat, 1601 mg sodium. 7. 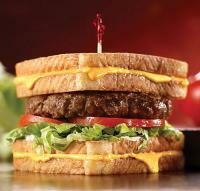 Worst Burger Melt – Red Robin All-American Patty Melt: 1254 calories, 94 g fat, 1951 mg sodium. 6. Worst BBQ Burger – Chili’s Shiner Bock BBQ Burger: 1300 calories, 74 g fat, 2840 mg sodium. 5. Worst Sliders – Applebee’s Cheeseburger Sliders with Applewood Smoked Bacon: 1340 calories, 87 g fat, 2550 mg sodium. 4. 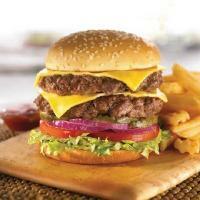 Worst Double Cheeseburger – Denny’s Double Cheeseburger: 1400 calories, 87 g fat, 2680 mg sodium. 3. Worst Crazy Burger Creation – Friendly’s Grilled Cheese Burger: 1540 calories, 92 g fat, 2490 mg sodium. 2. 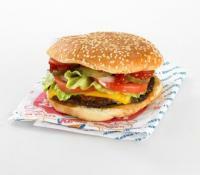 Worst Fast-Food Burger – Sonic Ring Leader Loaded Burger Double Patty: 1660 calories, 120 g fat, 1450 mg sodium. 1. Worst Burger in America! 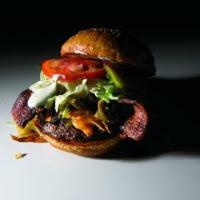 – Chili’s Jalapeño Smokehouse Bacon Burger: 1910 calories, 126 g fat, 5290 mg sodium. Information courtesy of David Zinczenko with Matt Goulding of Yahoo! Health. Wow! Now that I’m sufficiently salivating, what say you? I’ve actually had #1, #6, #9, and #11. And, let me tell you! #1 is so goooood!!! Back to spinach salad with grilled chicken for me…blah! Haha, well, you don’t have to watch your waistline! I guess it would be hard to find burgers of this “yumminess” where you are. Be safe! As always, great style. I really love the top – gorgeous – I want! I think of France when I hear the word lavender 🙂 I used to go there with my parents every year. Oh, how nice!! Do you still travel to France? Hubby thought the blouse was kinda hippieish?! I just like the embroidery details. Those lavender jeans pants are so pretty!! Lol! I hope you’re having a super time! “A heart attack waiting to happen” burgers!! But, it tastes so good! Gorgeous, gorgeous outfit and pictures! 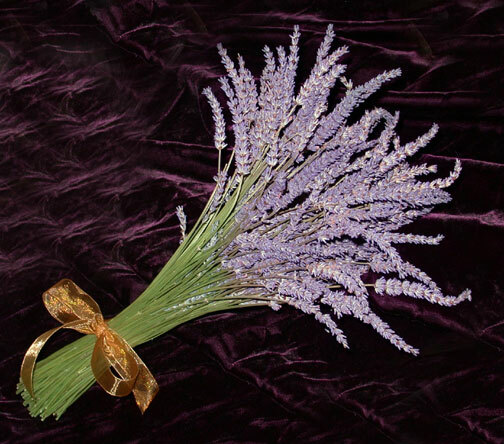 Lavender always makes me think of peace and calm!! I also love the PJ picture you did for Terri’s party! You are so classy!! I hope you can stop by to see the Fiesta Fashion Show I covered yesterday!! I did see the photos from the show! Looks like a fun time! Thanks for sharing! gracefully50. You always bring beauty, sunshine and laughter to my soul. So many girls in Africa are called Lavender and looking at your pictures, I now understand why! The ugliest Hambugers made me laugh although I did lose appetite for Hamburgers at the moment. I do very simple meals. Regards to Tobi. Thanks. Thank you Omwa! So sweet! Those nasty burgers are terrible for your health but tastes so good! I hope Happy is doing well! The lavendar pants are so feminine. I tried on two pairs of Lavender jeans last week but decided they were too much for me and bought white ones instead. Good for you for wearing lavender jeans! I love how you’ve pair them with a frilly white blouse. Beaituful! I’m sure they looked great on you. The white jeans are definitely more versatile…a must for this spring & summer. Super cute, Jeannie. I just love lavender! enjoy the weekend. Most of those burgers would be a whole days worth of calories…yikes. Yikes is right!! I had no idea they had so many calories,,,even the healthy turkey burger! That Tobi is just the cudliest little pup ever. He’s all ready for nap time! And your nutrition info has me grateful that, although I love burgers, AND I love bacon, I don’t love the two together. Whew! I am a new reader…..I find myself looking at your blog as one of the first that I read. It was a great blog this time…..from the lavender to the worst hamburgers. Thank you! I SO appreciate this very much! THANK YOU for that post–not only do I WANT that shirt right now, but promoting awareness of the dangers of that kind of food is such a needed thing to do. I think that abysmally unhealthy eating and excessive reliance on painkillers (both over-the-counter and prescription) are the most dangerous and destructive health threats in North America today. Drastic action and more dissemination of information on these matters is desperately needed. Can you tell you hit a nerve? There was a great article in one of the recent 2012 Vogue magazines outlining the terrible dangers of over-the-counter painkillers which I would encourage people to find and read. Here’s to health, the number one way to prevent aging. That is right; it won’t change. People need to be informed and responsible for their own health. And that means doing the tough things, asking doctors critical questions, reading LOTS of labels, and saying “no”–to themselves–a lot. People are dying off in droves because of painkillers and nobody is really doing a thing about it. Oh you are such a delight! How soft and pretty you look in this combo. Very girly, romantic. You even have nice pj’s!!! Didn’t see the JR Whopper on the count…..does that mean it doesn’t count..lol. Haha, JR Whopper maybe the 12th worst burger…who knows? I was in total shock when I saw the calorie count on those burgers…yeek! Hi Jeannie, few things are as nice as lavender. I love the smell and color. It is a valuable source of inspiration to make an outfit. Today you saw a beautiful blouse, with a very nice fabric. I love the way they have sleeves. And the pants, lavender, are gorgeous. The bag is spectacular in form and colors. As always, perfect. The outfit has a wonderful romantic touch. Congratulations. Thank you for such a thoughtful and sweet comment. I love the youtube link for the violin concerto…it’s beautiful! Thank you so much! Yes, I think so, too. I’m very fortunate that he’s still hanging in there with me. Have a wonderful weekend Laura! What is the orange in the background on the first few photos? 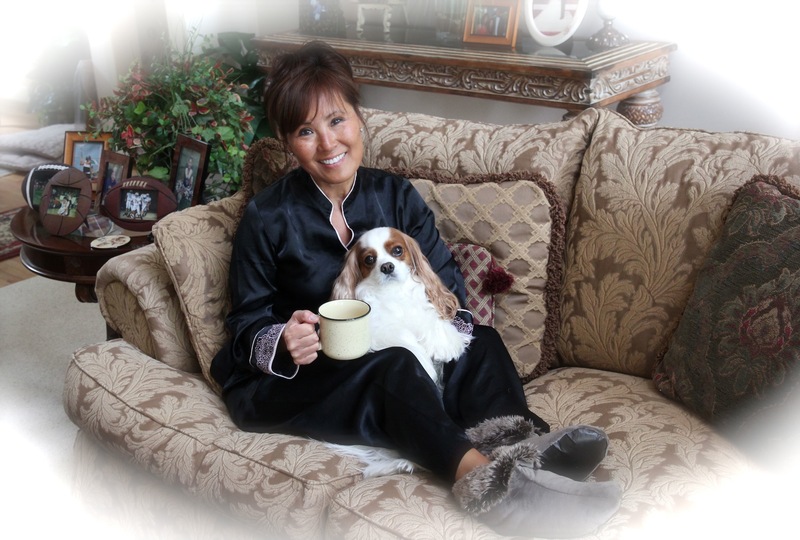 Thank you for linking up to the pajama party–you look so elegant! Thank you! It’s pretty sad that I have to wear those in April. When i hear the word “lavender”, i IMMEDIATELY think “Lilac”. especially this time of year… great outfit! like the mods to the pajama party pic, too! you are completely and totally adorable! happy weekend to you! thanks for a much needed smile…. Oh, so sweet!! Thank you so much daisyfae! I am only qualified to answer the very first question. What do I think of when I hear the word lavender? It is neutral. It is peaceful. I hope this does not seriously damage my image as a macho man. Haha! No, not at all! I would never have thought of wearing lavender jeans but I absolutely love yours! I’m fond of it, too! 1) lavender is one of my fav. Scents! So relaxing. 2) you look amazing in that color! So much calories in those burgers….no wonder they’re so good!